When you’re the smallest guy on the team, nothing is given to you. Troy Stecher knows this well, as a 5-foot-10 defenceman playing a position traditionally dominated by behemoths. The Richmond native was never drafted, instead signing with the Canucks as a free agent after a successful third year with the University of North Dakota. He turned heads at his first training camp, but was sent down to the AHL. ‘See if he can keep this up in Utica,’ seemed to be the prevailing wisdom, despite the fact that Ben Hutton successfully made the team as an opening night rookie the year before. Heaven forbid they risk exposing Philip Larsen or Luca Sbisa on waivers. Seems outrageous now, but that’s what happened. 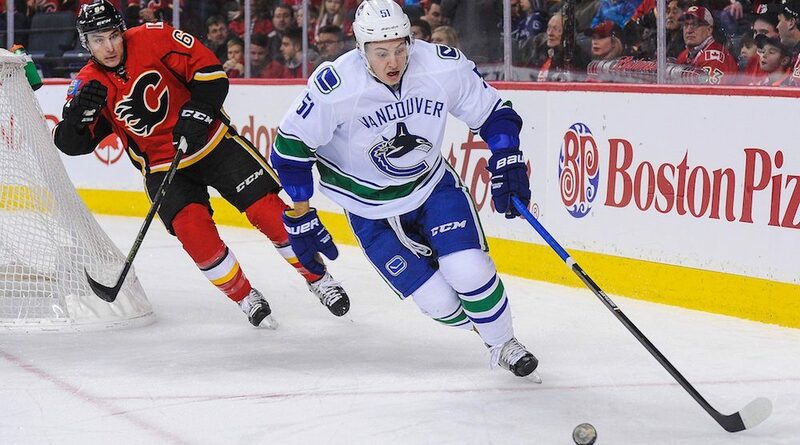 Nobody was quite sure what to expect from Stecher, who not only earned a call up early on that season, but went on to lead all Canucks defencemen in scoring with 24 points in 71 games. But when Travis Green took over as head coach last season, it was back to square one. Stecher began the season playing on a third pairing and didn’t receive much time on the power play or penalty kill, playing under 17 minutes in the first five games of the season. By the end of the year, he had won over Green and moved up the depth chart, regularly playing over 20 minutes per night. For whatever reason, Green was reluctant to give Stecher big minutes again to start this season. He was below Erik Gudbranson on the depth chart at even strength, behind Michael Del Zotto on the penalty kill, and passed over in favour of Derrick Pouliot on the power play. Indeed, as we wrote back in November, Stecher was being underplayed in all situations. He leads all Canucks defencemen in even strength scoring this season, producing 16 of his 17 points without the benefit of the power play. He’s also first in even-strength Corsi-For percentage among regulars on the blue line. And this isn’t a new development, either. Only Edler has more even strength points (46) than Stecher (41) over the last three seasons. Since he made his Canucks debut in 2016, Stecher ranks third among Canucks defencemen in Corsi-For percentage (48.96). It took more than half a season but slowly, Stecher has re-earned the coach’s trust. With Alex Edler out with a concussion, Stecher and Hutton have been thrust into the Canucks’ top defence pairing — something that didn’t happen when Edler and Chris Tanev were out of the lineup in November. Stecher is also contributing regularly on the penalty kill, and on Saturday he was given an opportunity to quarterback the first unit power play. The power play looked good with Stecher at the helm, even if they didn’t score. Stecher was teeing up Elias Pettersson and Brock Boeser with one-timers with more success than Hutton or Pouliot had in the past. In overtime, Stecher nearly set up the game-winner with a brilliant pass, as Bo Horvat hit the post. He wasn’t rewarded with an assist, though he did earn a helper when he set up Pettersson’s game-tying goal with the goalie pulled Thursday in Chicago. After barely playing special teams for Green before the new year (just 55 seconds per game on the penalty kill and 21 seconds on the power play), Stecher is now a leaned on heavily. The 24-year-old is averaging 24:57 of ice time, including 1:22 on the penalty kill and 3:13 on the power play in the three games without Edler. “I feel I play better when I get more minutes, I’m just more into it,” Stecher told reporters following Saturday’s game. Stecher may never be an offensive dynamo or a top pairing defenceman, but he’s a smart player that can skate and move the puck efficiently. He’s also fiercely competitive. Don’t let his size fool you… again.